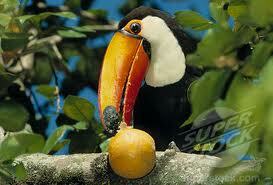 Toucans on television commercials love fruity cereal, but in real life, toucans would choose fruit over cereal. Toucans live in the rainforests of South America, where they spend their days eating fruit, insects and the occasional egg or small bird. Toucans have a long, brightly colored bill. It looks sharp, but it’s not designed for fighting. Instead, toucans use their bills to pick fruit. 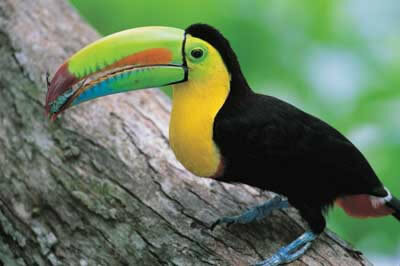 Toucans live in the rainforests of South America, where they spend their days eating fruit. 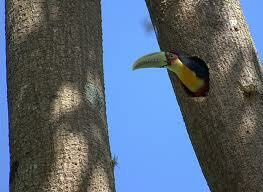 Toucans lay their eggs in holes in trees. Both the father and mother take care of the babies. Toucan babies don’t have big bills. The bills become larger as they grow. Toucans weigh just a little over 1 pound. These popular birds live in small flocks. They call and hoot to each other loudly. Some people keep toucans as pets. Toucans lay their eggs in holes in trees. More all about toucans, both the father and mother take care of the babies. A National Geographic documentary about toucans. Question: How big is a toucan’s bill? Answer: A toucan’s bill can be as long as his entire body. Question: Are toucans related to parrots? Answer: Toucans are related to woodpeckers. Enjoyed the Easy Science for Kids Website all about Toucans info? Take the FREE & fun Toucans quiz and download FREE Toucans worksheet for kids. For lengthy info click here. Declan, Tobin. " Fun Toucans Facts for Kids ." Easy Science for Kids, Apr 2019. Web. 24 Apr 2019. < https://easyscienceforkids.com/all-about-toucans/ >.